Slacker Radio for the BlackBerry Storm | BlackBerry Blast! Slacker announced Slacker Mobile, a free radio application for the BlackBerry Storm. 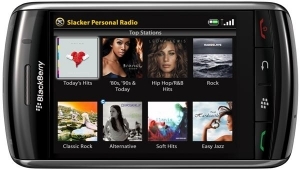 Slacker Radio is optimized for the Storm's touch screen, and can be used in both vertical and horizontal modes. Slacker Radio can be downloaded for free by visiting Slacker.com from your BlackBerry Storm. Slacker has an interesting feature called station caching, which enables listeners to store favorite stations on a memory card. This allows you to listen without a network connection.